Discussion in 'Shiny Things' started by tok-tokkie, Jan 16, 2012. In South Africa a crock = a beat up old car but the word is extended to apply to anything well past its prime & that is the category I fall into. The alternative spelling refers to the footwear I appear in on this trip. 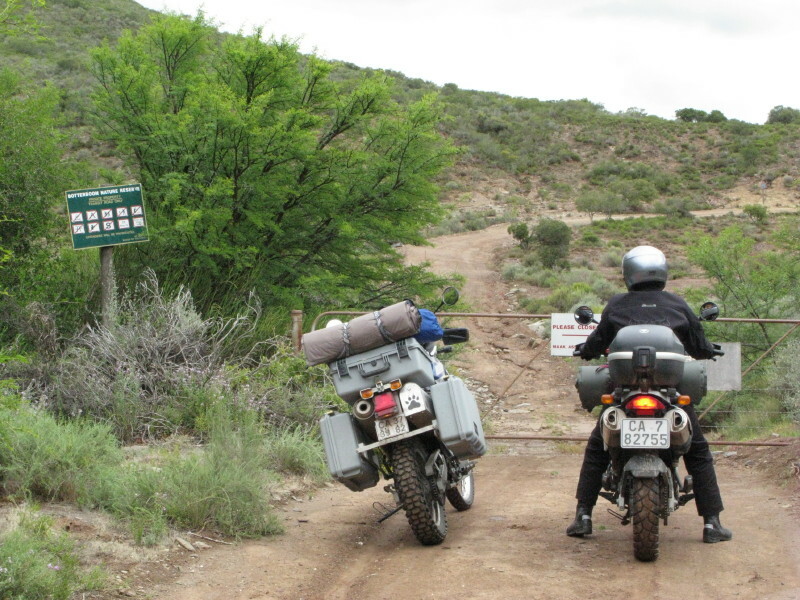 It is also a play on the Dummies Guide or Rough Guides that are published. So this will be a Crocs guide to some of the stationary steam engines in England. I am a retired Mechanical Engineer with a long standing interest in steam power  industrial more than locomotive. My wife, Antonia, and I went on a 10 day campervan trip in England visiting some of the stationary engine sites. I will describe them informally pretty much as a comic book  a picture with some comments below. Antonia is English & we were here for her sisters 70th & a brothers 60th birthday. This trip was done in a hired campervan, Antonia did the finding and booking. Her shopping criterion is price so we ended up with the most basic, small and cheap she could find. I will show it later in the thread. 4. Eclipse of the Steam Engine. I will also write about the engineering heritage. Antonia is an historical archaeologist (we spell it slightly differently & historical means since there are written records) so heritage is something that has rubbed off on me. I will also digress into some of the technical aspects that interest me. I hope to separate my postings by color so white text will be used for the steam engine posts, orange for the heritage and general off-topic stuff while lime green will be the technical stuff (light colors so they are easily read). My idea is to make it easy to skip the uninteresting stuff. I will happily wander off down loosely related side alleys. My writing style is usually dry & factual but I am going to try and write informally here  it does not come naturally. I will use footnotes for my references marked like this . If I am saying something not generally known I want serious readers to be able to see where the info comes from. I also want to separate some explanatory notes out of the body of the text. This is no academic paper but I want to distance it from fan-boy hypothesis and urban legend facts. First a little background and context. It is widely believed that James Watt invented the steam engine. In fact Thomas Newcomen invented them in 1712 which was 24 years before Watt was even born. By the time of Watt’s first engine in 1775 about 600 Newcomen engines had been made . Thomas Newcomen was an ‘ironmonger’ (= supplier & maker of tools & equipment) in Dartford in Dorset (bottom left on map of England). In Dorset and next door in Cornwall there were many tin and copper mines. These mines had a big problem with water which was pumped out ,literally, by horse power. 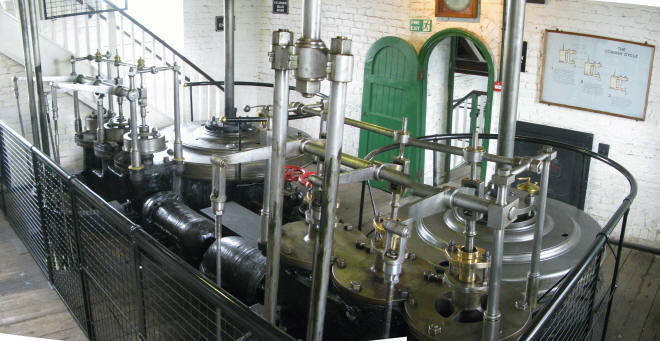 Newcomen saw the opportunity for a steam powered pump. His engine was huge. Here is a picture of the one Henry Ford bought & took to the USA where it may now be seen in the Henry Ford Museum in Dearborn, MI. 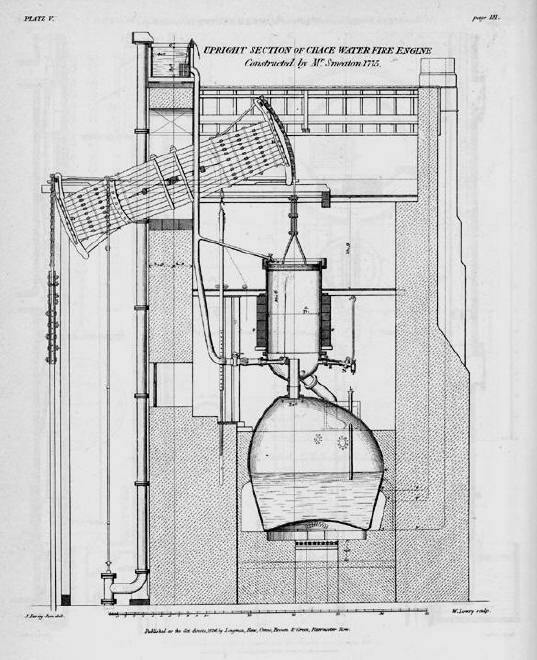 +Source* An early diagrammatic picture of a Newcomen engine. Check that title: The ENGINE for Raising Water (with a power made) by Fire.. I am an Engineer; the word springs from the Latin ingenium skill, talent. As this is what I would consider to be the very first engine it looks like the word was in use before the first engine even existed, presumably meaning machine. Notice the clothes the men is wearing, it gives a clue as to how long ago this was. I am really in awe of the courage of Newcomen. It is believed he spent 10 years developing it. That cylinder is cast brass (cannon technology), taller than a man ( 21” bore x 7’ 10” stroke = 533mm bore x 2.4m stroke) with a copper steam boiler directly underneath the cylinder in a specially built building with a huge rocking wooden beam way up overhead. The boiler was adopted from beer brewing. To have done that from a standing start – there was no predecessor to copy or develop upon. My admiration goes to him for starting with such a huge machine and sorting out details like chains running over arches to give the straight line motion needed by the pistons. To make the cylinder circular and straight it had to be rubbed with sand and wooden blocks – this was before the start of the Industrial Revolution so there were no boring machines or large lathes anywhere. He had to work out how to make a steam tight seal between the piston and cylinder. Although the cylinder was filled with steam it was not a real steam engine. It was an atmospheric engine. Water was sprayed into the cylinder to condense the steam forming a vacuum so that atmospheric pressure then pushed the piston down. I will post diagrams with proper description next. 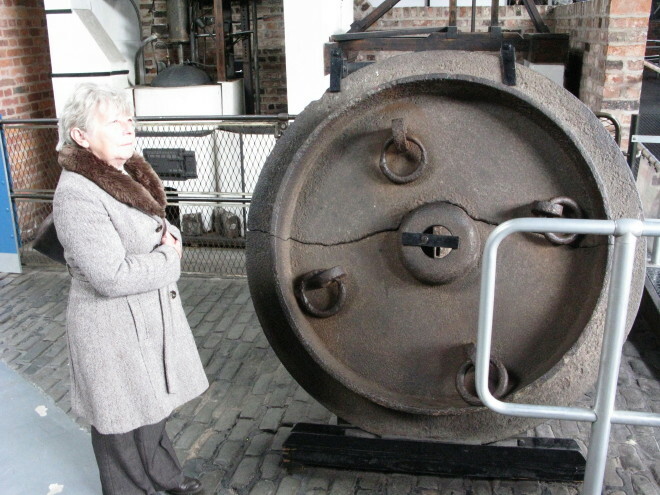 Here is a piston we saw at the Manchester Museum of Science and Technology with a person for scale. To form the seal between the piston & cylinder rope was wound round the lip. There were two heavy cast iron collets fitted on top of the rope to squeeze it out against the cylinder. Then water was continuously fed onto the top of the piston to form the air tight seal – the first two diagrams both show the pipe leading out to the top of the piston. Newcomen engines continued to be made for over 100 years – this is a later one with cast iron piston. There is a model Newcomen engine behind her – I did not notice it at the time. The piston was attached to the wrapping chain by 4 short chains from those rings. The truly remarkable thing is the automatic valves. This is a self-actuating machine. Up until then the only self acting machines were clocks. The small arch carries the ‘plug rod’ which is the cam shaft of this engine. There are pegs or collars on it which trip the valves at the right time to make the machine self acting – the origin of the word tappet we still use today. Originally Newcomen ran water on the outside of the cylinder to condense the steam but then figured out that a spray of water inside the cylinder was much better. The drain pipe from the bottom of the cylinder had to be long (as you see in the first drawing) and dip into a tank of water so the vacuum could not draw air in through the drain pipe. 1.….Queen Anne was the English monarch and the United Kingdom had just been formed by Scotland and England. 2.….No USA then as the settlers were still in the 13 colonies & had not expanded westwards across the Appalachians. The population of the colonies was about 380 000 . Declaration of Independence came 64 years after this engine. 3.….Australia was to get its first settlers in about 75 years after this engine. 4.….The first lathe to be made only of metal came 40 years later but it was 85 years after this that Maudsley made the first lathe with screw feed to the slide. 5.….Guns were muzzle loaded muskets. Cartridges and breech loading came about 100 years after this engine was running. This, to me, is the seed of the Industrial Revolution. Iron and bronze was melted using wood and charcoal not coal (the major use of which was home heating in London). Wind & waterwheels were the only non-animal power. The canal system did not exist let alone railways so everything went by pack horses or wagons on unmade roads unless a river or the sea was handy. 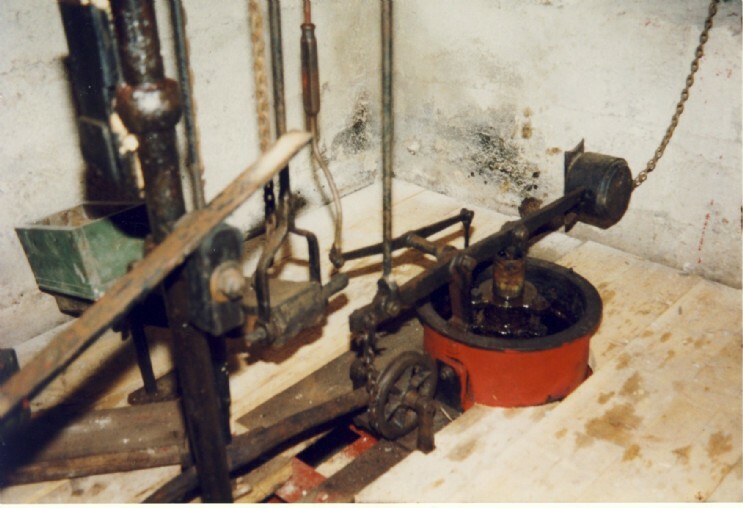 And yet this same basic design of a pump persists today in the pumpjack (nodding donkey). I went to the Science Museum in London – really to look at the clocks. There is this Newcomen engine there. The person at the back on the left shows how big it is. 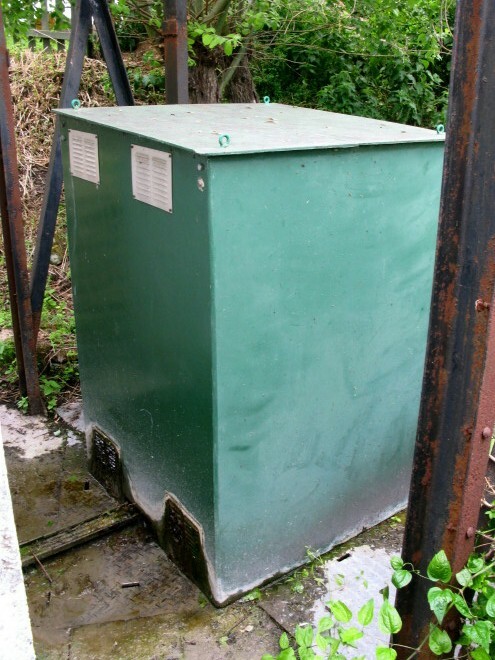 The A frame to the left is not a functional part of the engine but it does help to stabilise the structure and is useful when maintenance is required on the pump down the hole and it supports the walkway to the pump chain. The outside wall of the engine house is the wall that the beam pivots on as you see in the first few pictures. This is a relatively late Newcomen engine because it has a cast iron beam. Another picture I took a few years previously. There is one in his birthplace, Dartmouth, but it was way off our route. It was built in 1791 and was in use for 127 years until 1918 (15 years after the first aircraft flight!) which is over 200 years after the first one went into operation. Obviously Newcomen’s design was brilliant to have persisted for that long. Watt made his first successful engine in 1775 so you can see that Newcomen engines persisted well after the Watt engines were introduced. John Smeaton was probably the leading civil engineer in the late 1700s. Besides building bridges, canals, harbours and stuff he also did mechanical engineering like waterwheels and windmills. He was commissioned to provide an engine. First he did a very thorough investigation of several existing Newcomen engines by visiting and measuring (physical as well as performance) them before he made a working model to test his ideas. After that he made several steam engines, the initial one was a disappointment but his later ones were a very big improvement on the others (in that they used much less fuel = were more efficient). This is his best engine at Chacewater in Cornwall, 1775. Note the open top cylinder with the pipe for the piston water seal. The piston suspended by 4 chains. (Remember the 4 rings on the cylinder I photod?). Haystack boiler. The beam is exceptional, a 10 ply composite wooden beam formed so there is no loss of material for the axle hole. Although the proportions have been optimised there is no fundamental alteration to the original design of Thomas Newcomen. It represents the apogee of the Newcomen engine just as the Watt engines were coming into play. 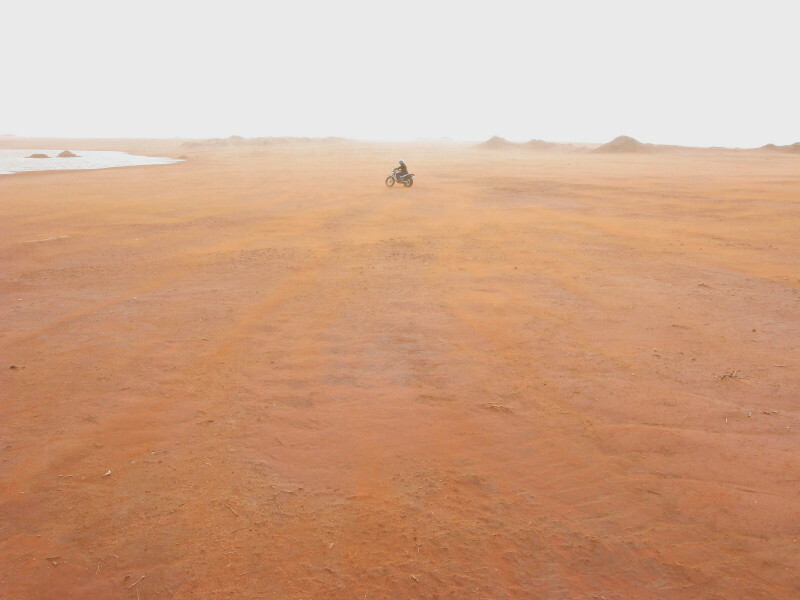 Photo: Chris Allen @ geography. The working replica Newcomen beam engine at the Black Country Museum. There have been a sucession of ages mankind has progressed through. Stone Age – Bronze Age -- Iron Age & Newcomen started the Steam Age in 1712. 2.….There is a Newcomen engine in his home town, Dartmouth Devon. It is hydraulic powered so not very realistic. This account of the first steam engine in America comes from a book about Newcomen by L.T.C.R Rolt. He is an interesting man, the eventual preservation and restoration of the British canals can be traced to him - I will make a long digression about canals soon. He wrote biographys of several steam engineers including my hero Richard Trevithick. Here is his account of the first steam engine in America. The most notable Cornish engine builders at this time were Jonathan Hornblower (son of Joseph, Newcomen's associate), John Nancarrow (who had provided Borlace's list of engines) and John Budge. The engines built in Cornwall were of a higher standard than those in the north of England, for fuel economy was all important and provided a great incentive for engine builders to strive for greater efficiency. Moreover, Jonathan Hornblower disseminated a wealth of experience which he had inherited from his father. It is appropriate that it should have been Josiah, a younger brother of Jonathan Hornblower, who was responsible for introducing the Newcomen engine to the New World. This historic engine was ordered in 1748 or 1749 by Colonel John Schuyler who, with his two brothers, owned a copper mine in what is now North Arlington, New Jersey. Copper had been found on the Schuyler estate in 1715 and was profitably worked by driftways until 1735 when it became necessary to sink a shaft. The ore was exported to the Bristol Copper and Brass Works where it fetched $40 a ton. When the shaft reached a depth at which the water could no longer be cleared by horse power, John Schuyler made the inquiries in London which led to his order. Josiah Hornblower was chosen, perhaps by his better known elder brother, to erect the engine and on 8 May 1753 he set sail from Falmouth on a coasting ship bound for London where the engine parts, many in duplicate and some in triplicate, had been gathered ready for shipment. With the engine and its erector on board, the American ship Irene sailed from London on 6 June 1753 and encountered such rough weather and adverse winds in the North Atlantic that she did not reach New York until 9 September. The rigours and perils of the crossing were such that Hornblower swore he would never make an ocean voyage again. Much to the sorrow of his family in Cornwall he kept his vow and never returned. At New York the engine was trans-shipped to a smaller craft which carried it through Newark Bay and up the Passaic River to an unloading point at Belleville opposite the mouth of the Second River. It was then carted overland for about a mile to the head of the mine shaft which was located near the junction of Belleville and Schuyler Avenues in North Arlington. So arrived the first steam engine in the American continent, an event less celebrated than the landing of the Pilgrim Fathers but no less pregnant with significance for the future. All the engine parts were on site by the end of September 1753, but erection was a slow and laborious job for Hornblower. Stone for the engine house had to be quarried from the mountains and trees felled for the engine beam and other timber work. The accounts show that no less than 211 days were spent in carting stone, timber and clay for bricks to the site, and it was not until March 1755 that the engine was set to work. The engine appears to have worked well and was twice rebuilt following damage by two successive fires before the mine was finally abandoned in the early years of the nineteenth century. It would appear that at each rebuilding a new cylinder was fitted, the first two being of brass and the last of iron. The diameter of the brass cylinder is not stated, but on the 1889 evidence of Mr Justice Bradley of Washington, who married a grand daughter of Hornblower, the last cylinder 'was of cast iron, an inch or more in thickness, nearly eight feet long and more than two and one half feet in diameter'. A relic preserved in the Smithsonian Institution, the United States National Museum at Washington, is believed to be the lower half of this cylinder. The engine is said to have pumped at the rate of 134 gallons per minute from a depth of 100ft using a 10-in diameter pump barrel, an iron lifting pipe in 8ft sections and wooden spears. Josiah Hornblower married and settled in the district where he was associated with the mine until 1794. In that year he built for the last owners of the mine, Messrs Roosevelt, Mark and Schuyler, on land which he sold to them on the outskirts of Belleville, the first ore stamping mill in America. Here, too, the mine owners established a foundry and machine shop where the first steam engine to be manufactured in America was made. This works was named Soho after its famous counterpart in England, but the historical link is not with Boulton and Watt but with Thomas Newcomen through Josiah Hornblower and his father, Joseph. Josiah Hornblower died at Belleville on 21 January 1809 in his eightieth year. 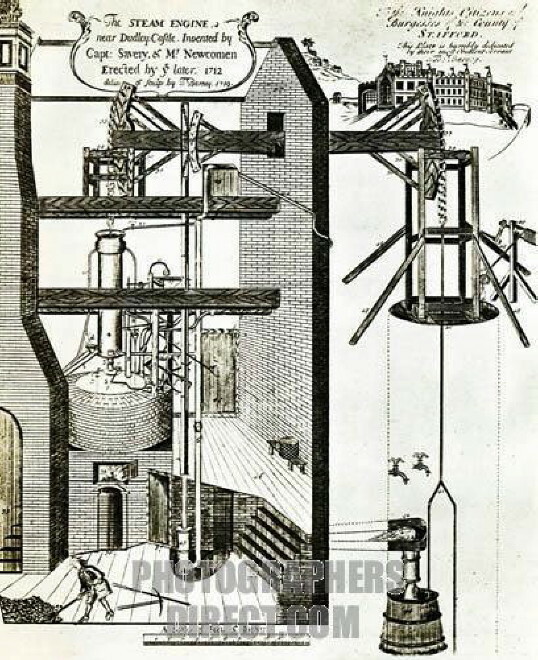 According to C. W. Pursell's Early Stationary Steam Engines in America the only other atmospheric engines built in America were at a Philadelphia distillery in 1773 (which was never completed), at New York Waterworks about 1774-6 and at an iron mine in Rhode Island about 1776. You may find this link interesting. It seems to have taken Belleville some time to honor Mr. Hornblower. Oddly enough I use to work in Belleville NJ. i am not f***ng stupid,but i used too. niles mi. They have stationary ones from various plants. Thanks for the link to Bellville. How a Newcomen Beam Engine worked. Here is an excellent animation. It omits some items. Speed of animation is adjustable, each step is also illustrated below the animation. 1.….Steam did not push the piston. Instead the steam was drawn into the cylinder as the piston rose due to the weight of the pump rods on the other end of the beam. Steam was then made to condense by spraying water into the cylinder so the air pressure on the upper side forced the piston down. The diagram is wrong – the cylinder is open at the top. 2.….The left hand side (in the diagram) was heavier so once the piston was pulled down valve B could be opened and the piston would be pulled back to TDC drawing in fresh steam which was at no real (gauge) pressure. Close valve B & open valve A letting water spray again to repeat the process. 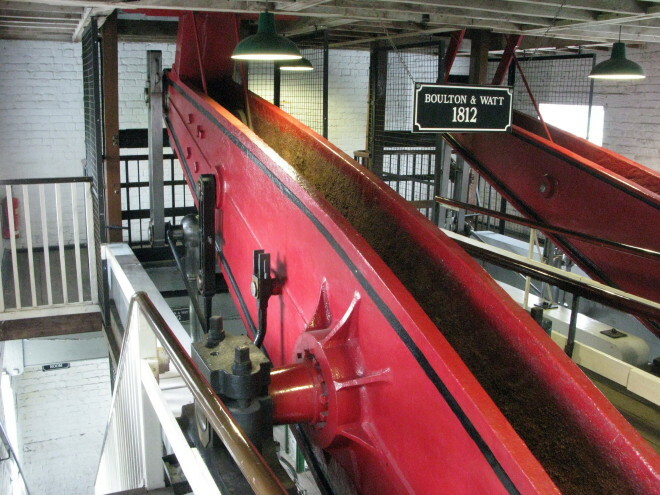 3.….The rocking beam has arches at each end with chains going down to the piston and pump rods. The arches ensure that the rods move in straight lines. The chains mean that only pulling forces can be used. Later changes had to be made so that the piston could push the beam and the beam could push a connecting rod to a flywheel. 4.….The diagram is poor because the collars on the vertical plug rod (rod that operates the valves) should be spaced apart so the levers are only activated at the ends of the stroke – not progressively as they would be as drawn. Note also in the earlier drawing of the engine the valve and priming pump are operated by small arches on the beam. 5.….Note that there is a cistern tank up near the pivot of the beam which is kept full by the little pump on the left also operated by the beam. 6.….These drawings don’t show it but the earlier drawings show the pipe from the header tank taking a small flow to the top of the piston to form the air tight seal. Air in the cylinder would not condense so if there was an air leak the piston would short stroke more and more as air leaked in at each stroke. 7.….No drain from the cylinder is shown in this diagram. The first diagram shows the pipe going down into the cellar. It had to be quite long ending below the water surface of the sump. As the steam condensed in the cylinder dropping the pressure so water from the sump was drawn up the drain pipe – it needed to be long enough that air was not drawn up into the cylinder – it was an automatic valve in effect preventing air getting into the cylinder through the drain. 7.….Also missing is the snifter valve. It is a small valve at the base of the cylinder. When opened steam would blow out. It was used to purge the air from the cylinder before starting the engine and also to purge any air that accumulated during running; air that had been dissolved in the boiler water. 8.….The second drawing is also incorrect in showing the top of the cylinder being closed. It was open as in the first drawing. Closing the top was one of the changes Watt made. The big shortcoming with these engines was the need to reheat the cylinder every stroke. The water spray condensed the steam but it also cooled the cylinder. Then, as the piston moved down, the upper part of the cylinder was exposed to air on both sides so it cooled. Besides that the piston had a steady flow of water above it to form the piston water seal against the cylinder. When fresh steam was drawn in it condensed as it heated the cylinder. A large part of the steam used to drive these engines was taken by this parasitic re-heating of the cylinder every stroke. Watt made two subtle changes which addressed that deficiency. There is one Newcomen engine in the USA at the Henry Ford Museum. One in Dartmouth Devon, England (Newcomen’s home town) and a replica at the Black Country Living Museum near Dudley , England (where the first Newcomen engine was erected). There is also one at Elsecar in England but it has been heavily revised over the years and is not open to the public. Great thread. Something I was always curious about but never pursued beyond observation of steam powered tractors and railroad engines. Thanks. This thread brings to mind a company that sold model steam engine castings. I've tried to find it again, think it was called Leroy's maybe in Indiana. They had engines up to ones like in the link below. Self starting reversing. Don't want to nit-pick but Dartford is in Devon, not Dorset. Great thread BTW, I used to go to sea on a steamship and like history lessons. Nice site! Got Leroy's narrowed down to selling Stuart engines, but nothing on Leroys yet. They use to have display set up at Old Threshers as I remember. Sorry, Dartmouth is in Devon! Thanks for the responses. There is a lot to see on that model site; I have just skimmed it. Newcomen engines were used to pump water, mostly from mines. There is a need to match the pump to the water load because if the pump draws air instead of water the engine overstrokes and the piston smashes into the bottom of the cylinder – very destructive. There are two ways of doing it. The earlier way of regulating the engine had been to make it short stroke by moving the pegs on the plug rod – literally only do partial strokes so it pumped less. This was terribly inefficient on a Newcomen engine because much of the energy was wasted in reheating the cylinder and this regulation did nothing to lessen that parasite load though it reduced the work done. It was precisely that deficiency that James Watt addressed which transformed the steam engine. Before Watt did that a famous engineer, John Smeaton, made a thorough study of Newcomen engines which greatly improved their performance. One of the improvements he introduced was a cataract to regulate the engine. The cataract was a very effective and economical way of controlling the engines so that their duty matched the current load. A cataract is an hydraulic egg timer making the piston pause before doing the power stroke. The number of strokes per minute was thus regulated. Each stroke is still a full stroke so the efficiency does not change even though the pumping rate does – most other regulating systems sacrifice efficiency as the pumping rate is reduced. A sidenote: On rotative engines the power can be reduced while keeping constant speed by adjusting the inlet valve cut off point; this is efficient & I will discuss it later but that is for mill engines running at constant speed not the present case of driving pumps at variable speed which is usually done by throttling the steam supply to slow the engine or alternatively making the engine short stroke. 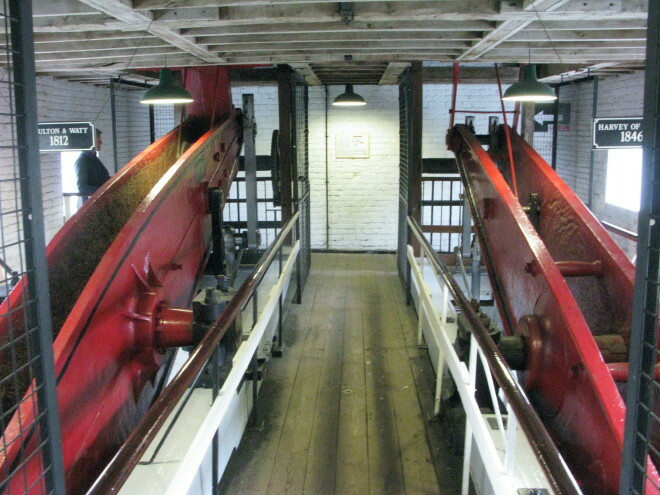 (Extracted from here: http://www.cruquiusmuseum.nl/englishsite/cataract.html ) That particular engine uses 2 cataracts to make it pause at both ends of the stroke to give time for the valves on the water pumps to close securely. I would expect the slot in the link to be set such that during the delay time the pin moves down the slot & then pulls the link just for the last bit of the time delay. The unlabelled vertical rod lifts the weighted lever. The piston a draws water into the cylinder through check valve d. When the rod is released the water escapes through needle valve c which can be adjusted remotely through rod g.
Picture by Spitfire at AditNow. A cataract found in a mine. EDIT July 2015. Link does not work & I have no copy of the picture. Before Smeaton introduced the cataract the usual way to regulate the engine was to make it short stroke by moving the pegs on the plug rod. This was very inefficient because most of the steam is used to reheat the cylinder each stroke so short stroking leaves the parasite heat load unchanged while reducing the work done. It was precisely that deficiency that James Watt addressed and thereby transformed the efficiency of steam engines. I will make a separate post about James Watt and his contribution to steam engines. Here I want to introduce the changes he made to the Newcomen atmospheric engine cycle because we have now moved on from the Newcomen engines. 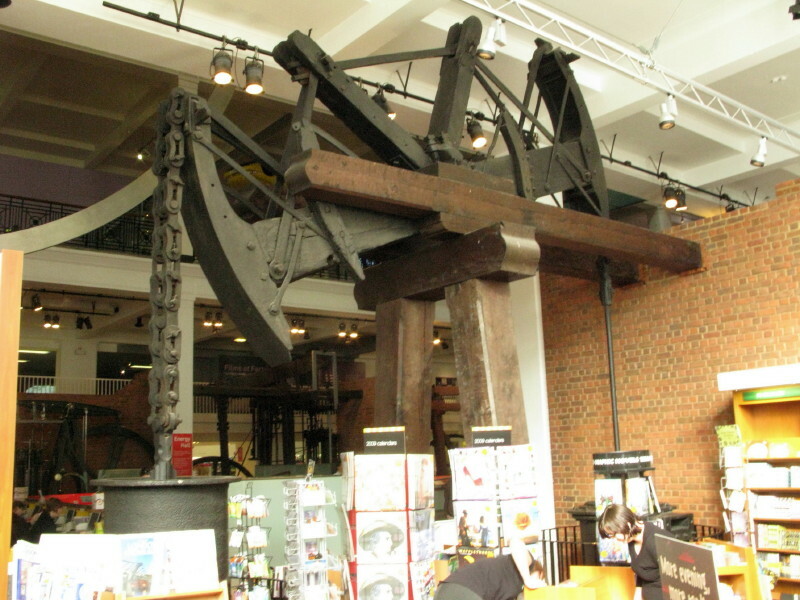 The next post will be about the Crofton Pumping Station where there is a Boulton & Watt engine but it has been upgraded to work on Richard Trevithicks Cornish cycle so the only Watt cycle engine we saw was at the Science Museum in London. James Watts early engine Old Bess in the Science Museum, London. This is the engine James Watt used for doing his development work. It was installed at the Boulton & Watt factory (=Soho Works in Birmingham)in 1777 where it pumped water from the waterwheel tailrace back up to the feed pond. This was the original method used for powering factories by steam engine (before rotative engines were developed). The engine still has the wooden beam and end arches for the chain connection; just like a Newcomen engine. There is so much misconception and exaggeration about Watts contribution that I quite resent the popular reputation he has. However, I have to acknowledge his separate condenser as being a great contribution to steam power. .Piston at BDC: close exhaust-valve to condenser & open steam inlet-valve (at bottom of cylinder). Weight on pump end of the beam pulls the piston up drawing in steam under it. .At TDC close the steam inlet-valve, open connecting valve to condenser & open water spray so the steam in the condenser condenses drawing in more steam from the cylinder as the steam at nearly atmospheric pressure drives the piston down. .Piston at BDC, close valve to condenser & open steam inlet valve to repeat the cycle. .The steam space above the piston is always open to the boiler so the steam flows in and out of the upper chamber. The steam pressure was slightly positive (3-4 psi, 0.2-0.3 bar) so almost all the power came from the vacuum created by condensation just as in an open top Newcomen engine. .The slight positive pressure ensured that no air leaked into the cylinder. Air does not condense so the piston would short stroke if it was present. The diagram does not show the air pump operated by the beam which pumped both the air and water out of the condenser. Air coming out of solution in the boiler and cooling water. The water from both the condensed steam and injected water. Newcomen had a water seal on top of the piston to exclude air. .By closing the top of the cylinder the inside of the cylinder was not exposed to cold air as the piston moved down. This was a lesser but significant contribution to the improved efficiency of a Watt engine (compared to a Newcomen engine). .The cylinder also has a steam jacket to keep it warm. Steam from the boiler condenses as soon as it meets metal below 212 °F (100°C) until the metal reaches the same temperature. The steam jacket contributed somewhat to the efficiency but it was the least effective of the three measures. This diagram shows the big improvement in energy efficiency that Watts separate condenser gave. It came about because of not having to re-heat the cylinder each stroke after the water spray had cooled it. 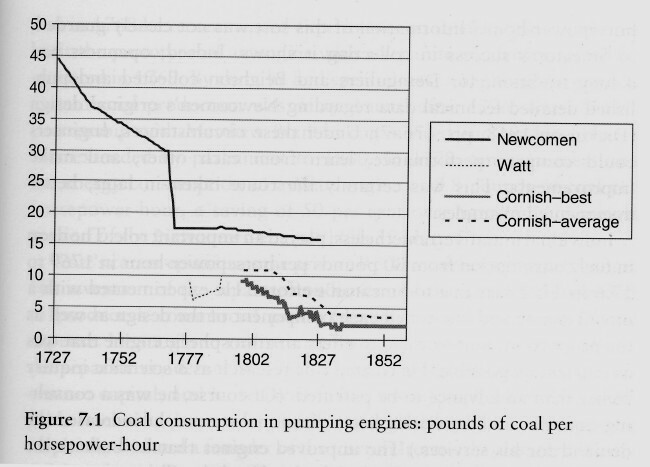 Newcomens original engines used 45lbs of coal per hp-hr but that was steadily improved so that by 1760 it was down to 30 lbs/hp-hr. The step change down to 17 lbs/HP-hr was brought about by the engineer John Smeaton who did systematic experiments on a model engine to determine the optimum arrangement  it was an engineering enquiry rather than R&D intended for patenting. But it is a dramatic illustration of the difference an engineer applying proper engineering principles can make to what technicians have produced. Then you see the improvement brought about by Watt where the consumption dropped to 7 lbs/hp-hr. After Watts patent expired in 1800 others were free to develop the steam engine further. My engineering hero, Richard Trevithick, was a leader in that & I shall be writing much about him in a separate thread. Notice from the graph that Watts engines came in 50 years after Newcomens and that Newcomen engines persisted long after Watts patent had expired. One of the things Smeaton introduced was the cataract for regulating the speed of a Newcomen engine (detailed in the previous post). 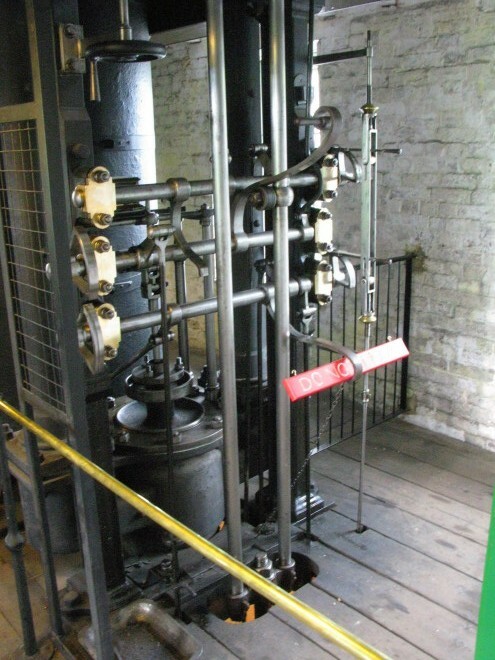 All the beam engines we shall see in this thread use the Cornish cycle developed (mostly) by Richard Trevithick; you will see that the Cornish cycle engines use about 1/3 of the fuel that a Watt cycle engine does. There will be a post about the various cycles. The next oldest engines we saw were at Crofton on the Kennet and Avon canal. It is a water pumping station for the canal. In the picture the water source is in the foreground with the canal just behind it and the pumping station behind with the tall chimney. The photo also includes the railway just behind the canal = what put the canal out of business. This poster shows how it works. 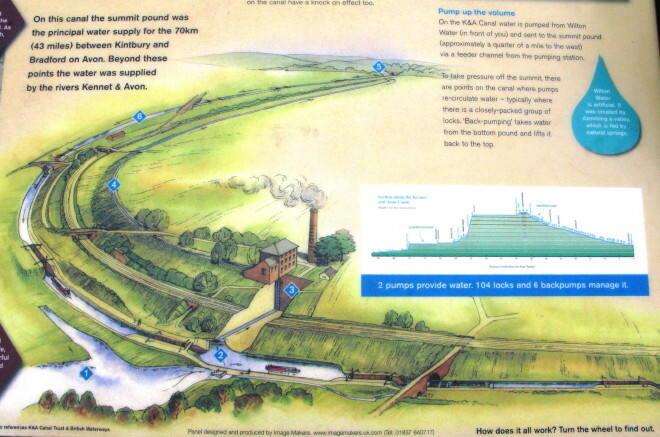 1 is the stream 2 is the canal with a tunnel leading the water back to the well under the pump station. 3 is the well. 4 is the water channel (called a leat)taking the pumped water to the highest point on the canal at 5. Notice the green section diagram of the canal. I will show some pictures of the very steep bit in a later post. We visited here towards the end of the tour. It is a terrific little site. The canal has been restored with a lot of barges; special ones called narrow boats & I will show you why. 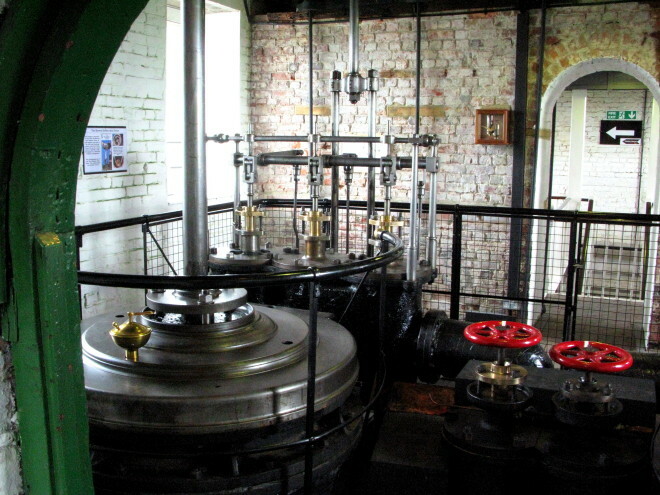 The two beam engines have been restored & when they are run the electric pump is switched off. These are the oldest steam engines still in their original building and performing their original function. What I really liked about this site is it has been tidied up but it has not been over restored so the building retains its original character. The engines were not in steam when we were there. Because the building forms part of the engine support structure I was unable to get pictures of the whole engine. 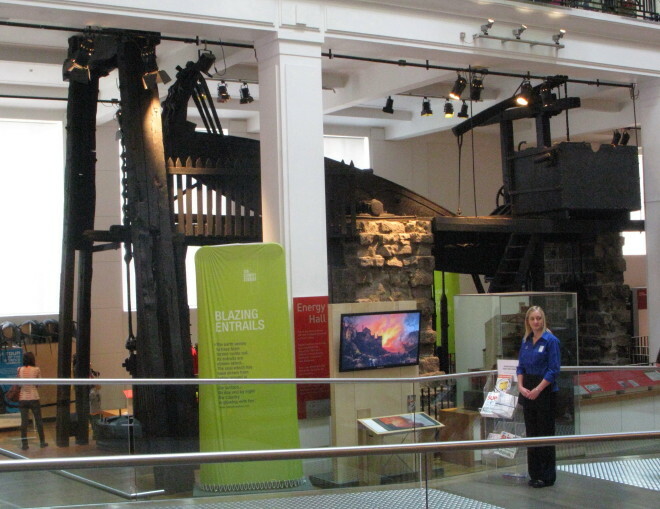 Here are the two beams; on left is Bolton & Watt engine of 1812. On the right is the Harvey engine of 1846. They have been updated to operate on the Cornish cycle which is much more energy efficient than the original Watt cycle. EDIT: To be a bit more precise about the engines. 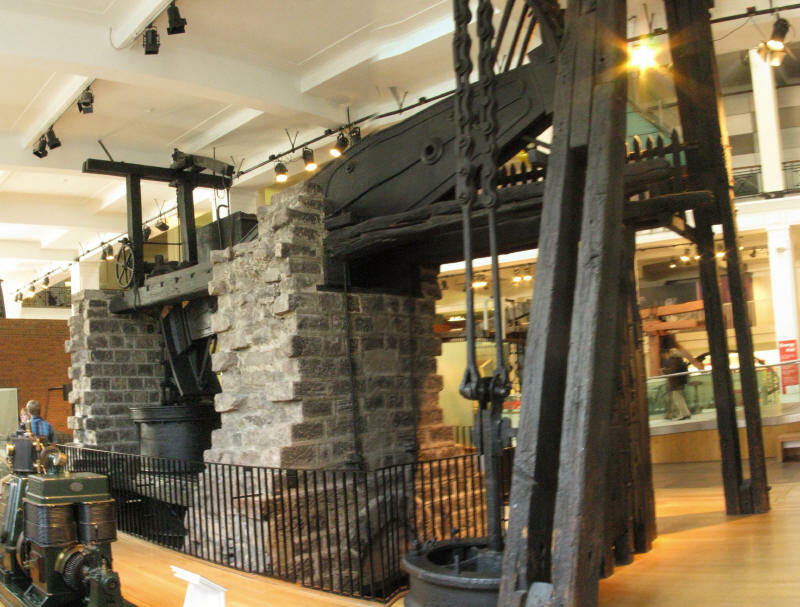 1.…1807 The first engine was a used Boulton & Watt engine, built in 1802 & installed here in 1807. 2.…1812 The second engine was a new Boulton & Watt 42” atmospheric engine installed in 1812. 3.…1843 The original boilers were Watt wagon boilers giving 5 psi maximum. They were replaced with Trevithick style Cornish boilers giving 20 psi in 1843. Work done by Harveys. 6.…1905 Sims engine is rebuilt as a Cornish cycle engine with 42” cylinder. 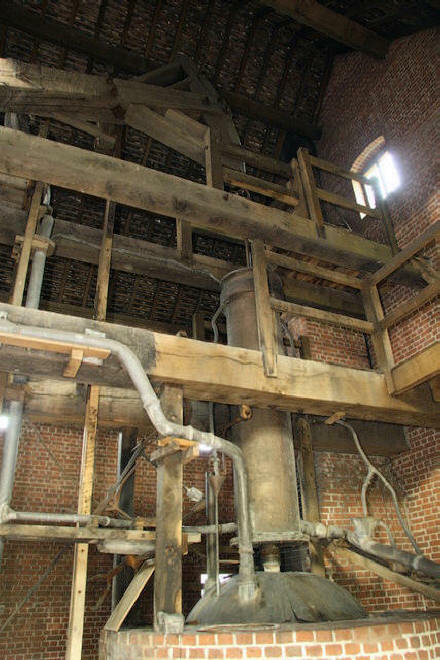 So what remained was the basic design of Newcomen = rocking beam supported by the building with cylinder one side and pump the other. Watt’s separate condenser and parallel motion. Trevithicks’s Cornish steam cycle and valvegear and his boilers (later replaced with Lancashire boilers which are a variation on that theme). A Newcomen engine with arches at each end of the beam for the chains to the piston and pump could only pull = single acting engine. When Watt developed his rotative engine he had to come up with a scheme so that the engine could both push and pull on the beam and the flywheel at the other end. He developed the parallel motion for the piston to beam connection – the thing he was most proud of. And I fully concur with him. It is the most mechanically elegant answer to the challenge of guiding the piston rod in a straight line while using the limited manufacturing resources then available. 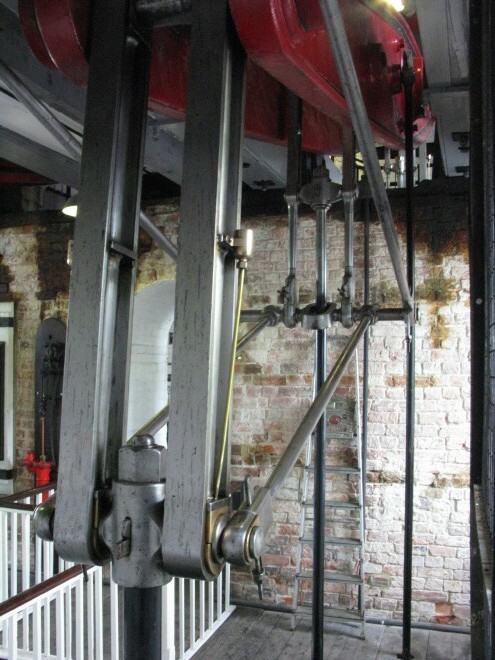 So these beams do not have the arches and chains at the end as Watt used his parallel motion on all his later engines – including single acting pumping engines like these. Cylinder head of the Boulton & Watt engine with the valve chest behind. The plug rod coming down from the beam to operate the valves. The engine operates on the Cornish cycle which I will describe later. This picture illustrates what I so much like about this site – the patina that has developed in the building over the years has been retained. It has not been sanitised or sterilised; rather it lives as the genuine thing. Had those walls been given fresh paint or, worse, plastered to make it all neater then it would have the character of a replica. I would love to be here when they run the engines. The cylinders of the two engines. They are really crowded into the building but remember that the building is also the frame that carries the oscillating beams so compactness is an advantage. This is down a floor on the Harvey engine. There are three valves on a Cornish cycle engine, 1 steam inlet 2 steam equilibrium valve & 3 steam exhaust valve (to condenser). Hence the three shafts each with the long lever (one with red sign, one resting on the tappet roller on the plug rod) and the third in the fully down position. There is a good animation of these valves working on the videos linked at the end of this post. The Watt Parallel Motion Linkage. There is a post coming up later about the way the linkages were made and assembled. This quote from July 2009 is just marvellous. 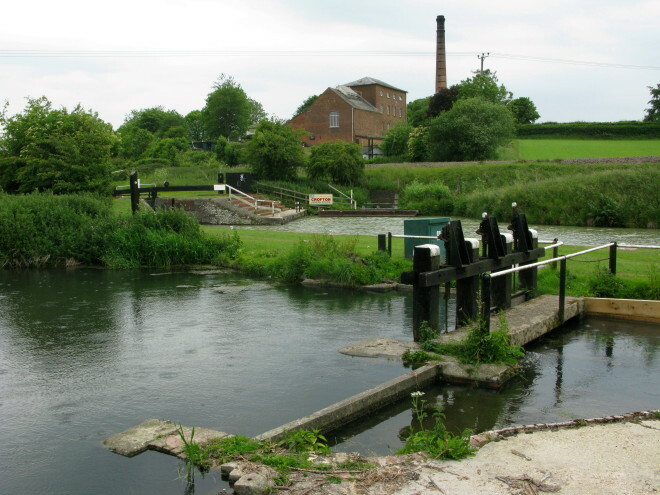 Two historic steam pumps, built in the 1800s, are being fired up to save a canal in Wiltshire from running dry after modern electric pumps failed. British Waterways asked Kennet and Avon Canal Trust volunteers, who run the pumping station at Crofton near Marlborough, to save the lock. Three tonnes of coal will be used, over two days, to fire up the Georgian beam engine pumps - built in 1812 and 1843. The canal has been closed between Crofton Crossing and Wootton Rivers. The canal is owned and operated by British Waterways. 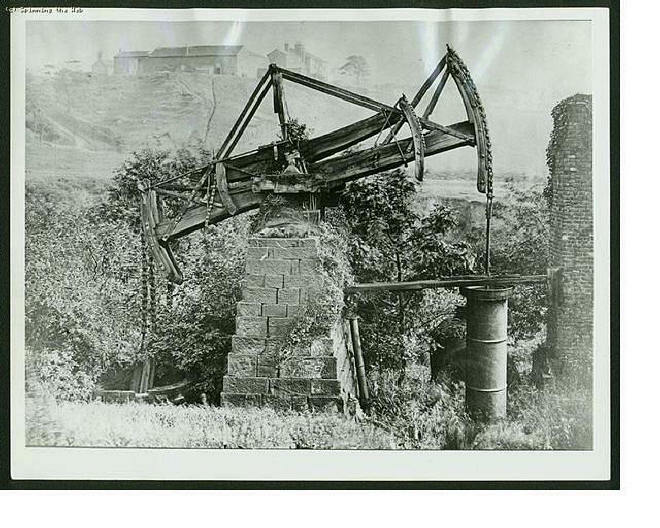 The failure of the electric pump meant that no water could be pumped back up to the highest point of the canal, near Crofton. British Waterways decided to close the canal because if boats used the lock system to get up the hill the canal would quickly run dry. Pam Holt, from Cambridge and currently on a long boat holiday on the canal, described what happened when she arrived at the lock on Friday. She said: "We arrived at the lock yesterday and were told it had closed because one of the pumps had 'blown up'. "It has been a wonderful thing to see the team from the museum using the old pumps for the thing they were intended for and actually doing it for real and not just for show." Crofton Pumping Station was opened in 1810 and fell into disrepair in 1959. It is now a museum exhibit run by the volunteers. *Source* It includes a video but it is less informative than the ones I have linked. The engines are very similar. Harvey engine built in 1846 as a Sims compound engine. It was very troublesome and ceased working in 1852. In 1905 it was converted to its present form as a single cylinder Cornish cycle engine. 3.….Both working 4.28min. Much is too close up, wider view would be better. Next will be a short post showing the differences between lift and force pumps. Then follows a long digression about canals seeing this is a canal pumping station. It will be a nice day out in the fresh air with lunch beside the canal. The Cornish cycle was created by Richard Trevithick in 1811 after the expiry of the Watt patent (1800) which allowed development of the steam engine to resume after a generation of stagnation (patent lasted 31 years). Essentially it uses high pressure steam on top of the piston as an addition to the standard Watt cycle. Diagram of a Cornish cycle engine.
. Pressurised steam is sent to top of cylinder driving the piston down.
. At the same time steam in the bottom of the cylinder is condensed in condenser (not shown) thus also pulling piston down.
. Steam inlet valve closes at 1/3 stroke. Expansion of steam completes the stroke.
. At bottom of stroke Exhaust valve closes & Equalisation valve opens. Weight of pump pulls piston back to top & displaces steam from top to bottom.
. Cycle repeats. Steam used 2 times. 1st in top which includes expansion phase. 2nd at bottom through condensation.
. Although both sides of the piston are working the engine is still single acting  power from the down stroke only. The big difference was using high pressure steam and then allowing it to expand so as to use that portion of the thermodynamic energy. It should be noted that the vacuum produced by these engines provides a significant proportion of their power. Both engines at Crofton run at vacuum of 25 inches Mercury (-12 psi,-0.9 bar), compared to a boiler pressure of 20 psi (1.7 bar) which probably equates to a cylinder pressure of no more than 8-9 psi(0.6 bar). Certainly when starting these engines the driver is only too aware of the vacuum developing as they 'come alive' when this happens. The Cornish cycle was developed by my engineering hero Richard Trevithick. The benefit of the Cornish cycle is shown by this graph. The Newcomen engines at their best used about 17 lbs of coal to produce 1 hp-hr. Engines operating on the Watt variation of that cycle used 7 lbs per hp-hr but a Cornish cycle engine used half that. It was only after the expiry of the Watt patent in 1800 that development of the steam engine could resume. A Lift pump. I can't find a good drawing - imagine that the outlet pipe goes upwards as far as needed because the pump is always set as low as possible. Here the piston drops down against no resistance from the water as the valves in the piston are open to let the water pass through freely. When the piston rises those valves close and the pump raises the entire column of water. On the upstroke water is also drawn into the cylinder beneath the piston. On the downstroke that water beneath the piston is trapped by the foot valve. This is a force pump (also called a plunger, pole or ram pump). Right drawing is plunger being lifted which draws water into the chamber. Left drawing is the plunger falling. The inlet valve closes and the water is displaced up the delivery pipe. When used on a mine the pump rod provided the necessary weight to drive the water up but at places like Kew the pump rod had to have weight added to make it heavy enough. The significant advantages are it is not necessary to machine the inside of the cylinder and there are no piston seals to give problems. I am going to post a separate thread about Richard Trevithick. In that I will give some more details about Force pumps as it was he who introduced them. He refined and scaled up an already known idea.